This package will perform best with the following boot sizes, 8,9,10,11,12. The recommended weight range for a 160cm snowboard is 175-230lbs. 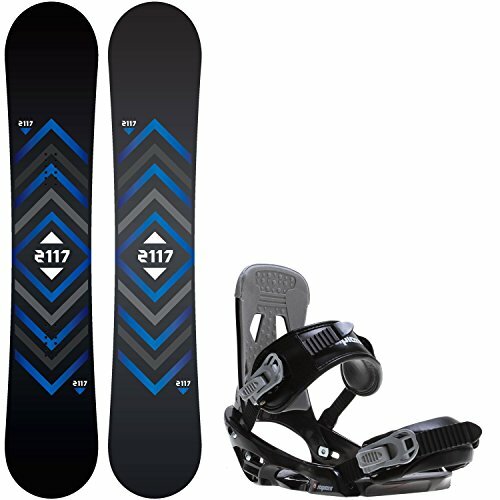 BOARD INFO: Step into the modern world with the 2117 of Sweden Berg snowboard. Centered around a full tip to tail poplar wood core and wrapped up like a bow with a Bi-axial top sheet providing a nice comfortable ride. The Berg will propel you into the 21st century. Key Features of 2117 of Sweden Berg Snowboard: Poplar wood core - The perfect combination of strength to weight ratio. Bi- Axial Fiberglass - Two layers of stitched fiberglass at 0 deg. and 90 deg. creates a forgiving and high performance flex profile. UHMW Extruded base material - Ultra High Molecular Weight extruded base material. This base is a proven performer with a low level of maintenance, for a consistent glide. Please Note: Base colors may vary. Email with questions prior to purchase. BINDINGS INFO: Key Features of the Sapient Stash Snowboard Bindings: Unibody Construction. Nylon with 10% Fiberglass, Baseplate and Highback. Eva baseplate pads. Eva highback pad. Adjustable toe ramp. Rotatable Highback. Adjustable forward lean. Stitched instep strap. Stitched over the toe, toe strap. Aluminum Double Axis buckles. If you have any questions about this product by 2117 of Sweden, contact us by completing and submitting the form below. If you are looking for a specif part number, please include it with your message.